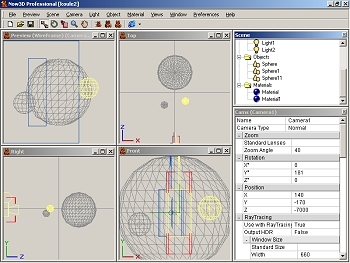 The program was named Now3D. You can easily create different objects and complicated scenes in it. Choose the right colors, set the right lights, select a position of your camera... If you use 2 cameras - like 2 eyes - you get 2 pictures. And you can combine them to create a 3D anaglyph picture for your 3D glasses. The Now3D software you can download from here - in the left menu click to Download files and in the right table click to an icon of a computer. (You can find the link to this program on our download page for members - and we update it there when necessary.) Run the downloaded file - it'll install itself. And then you can start your work. At the very beginning of your work you get almost empty scene with a camera which takes a picture of it and one light (so the scene isn't dark). Now decide what you want to create. Let's place to the scene for example 3 spheres. If you want create an object, choose the menu Object/Add or click with the right button of your mouse to the Objects item in the right window titled Scene and in the menu select Add. Select an object (sphere, torus, cube etc.) and choose the detail level (1-6) - at the beginning you can use the standard level 3. Your object is on the scene now. If you haven't changed window positions in the program, you can see the camera view in the upper left corner, on the right side the view from the top, down left the view from the right side and down right the front view. You can use your mouse to move, rotate and change the size of any object on the scene. To select the right action, push any of the 3 buttons beside the button with a floppy disk (this one saves your work). To select an object use doubleclick. The selected object is wrapped in a red wireframe. Now you've created a new material and you can use it on your objects. Click to the object you want and then in the Scene window use right button of the mouse to your material (you can find it under the Materials item - if you can't see it then click to the + beside Materials). In the menu select Elaborate and Assign Material to... (your object). You can see all lights on the scene as simple yellow stars. You can move with them as neccessary. In the similar way like with lights you can work with cameras. Click to Cams in the Scene window and use Add to create a new camera. At the very beginning there it is only one camera on the scene, but we need 2 ones - one for the right eye and one for the left one. Place both cameras beside each other - you can drag them by mouse or by clicking to the camera in the Scene window - then you can click to Position and change x, y, z parameters. We recommend to start by setting the first camera parameters to 0, 0, -7000 (standard position of the first camera) and the second one to -145, 0, -7000. Objects are usually placed to 0, 0, 0 position, when you move them to the camera you should remember they shouldn't be too near (don't forget the 1/30 rule - distance between the left and right camera should be no more than 1/30 of the distance of the nearest object). Click to the left camera now (for example in the list in the Scene window), and in the bottom window choose RayTracing and here set Use with RayTracing to True. Now the final picture is created by this camera. Now click to the Render button (it's right beside the Explorer button) - and the left picture is created. Save it to the disk (use the button with floppy disk picture). We could't write here about all the possibilities 3DNow software offers. You can change the size of every final picture (RayTracing/Window Size in camera setting) or change camera direction (Rotation in camera setting - use the same rotation for both cameras). You can set the color of every object and light (Color could be set in RGB - red, green, blue parameters), you can change the surface of objects (Bump Mapping). Complicated objects can be created by plug-ins or can be imported.